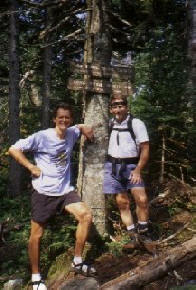 Bruce Acciavatti, right, has been leading hiking and snowshoeing tours for over 20 years. He is also a certified New York State guide. He'll show you the special out-of-the-way places and vistas, and can lead you to the best refreshments at the end of a satisfying day. He lives in the ancestral home of Wonder Walks, Bristol, Vermont. Brett Poirier, left, has been guiding tours for over 20 years from Hawaii to the British Isles. Whether the footpaths of England and Wales, the cliffs of the Big Island of Hawaii, or the back roads and byways of Vermont and Western Massachusetts - no one knows them better. He resides in Point Reyes Station, California when he's not scoping out new adventures.